Seems like there is nothing more important that productivity, but what about productivity without motivation? 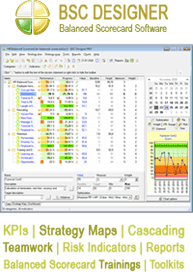 How long your people will stay productive when using the Balanced Scorecard? Will they will actually use all the indicators that you have designed. Recent research shows that the biggest challenge for the management is the motivation issue. Being Part of the Big Picture. The Balanced Scorecard connects your high-level strategic goals to the individual tasks performed by your line-level employees. It shows your employees that they don’t just do one small thing. It shows them how everything they do influences the whole company’s performance. In fact, they won’t just understand this; they can see this in action, and check it for themselves. That is a great motivator! Feedback. In some companies, employees do not get the feedback they need, or the feedback they do get is not clear. They do their jobs, but they are never sure if they’re doing them well. With the Balanced Scorecard, the feedback is more obvious. The employee can see how their tasks affect the overall performance of their business unit, and of the whole company. This is also a great motivator. There is eTraining that focuses on motivation issues when implementing the Balanced Scorecard.